A lacquer stem cup with a trumpet-shaped base and a shallow bowl with flared rim. 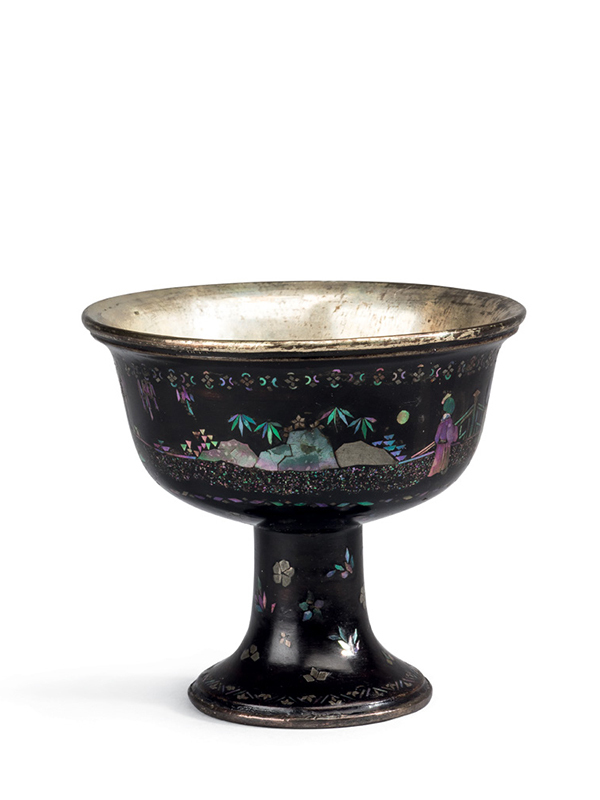 The bowl is decorated with a continuing frieze all inlaid on a black lacquer ground in tiny fragments of iridescent mother-of-pearl, carefully chosen to reflect different colours. It depicts figures in a landscape setting with trees, rocks, other vegetation and a fence. The lower part of the bowl and the stem are decorated with scattered flowers. The interior of the bowl and the foot are lined in silvered metal. Soft-shell inlaying in lacquer originated in the Yuan dynasty (1260 – 1368) and reached its peak in the late Ming and early Qing dynasty. The inlay on this charming stem cup is of the highest quality. 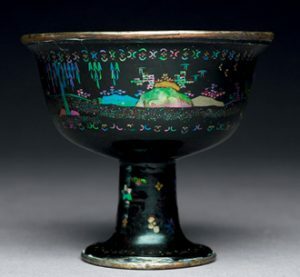 A nearly identical mother-ofpearl inlaid stem cup of the same size and decorated with figures in a landscape but mirrored, possibly the pair to the present cup, is in the collection of the Ashmolean Museum in Oxford, where it is attributed to the 17th century (fig. 1). Stem cups made in pairs can also be found in the tixi lacquer technique. Examples are in the collection of the British Museum, dated to the Ming dynasty.